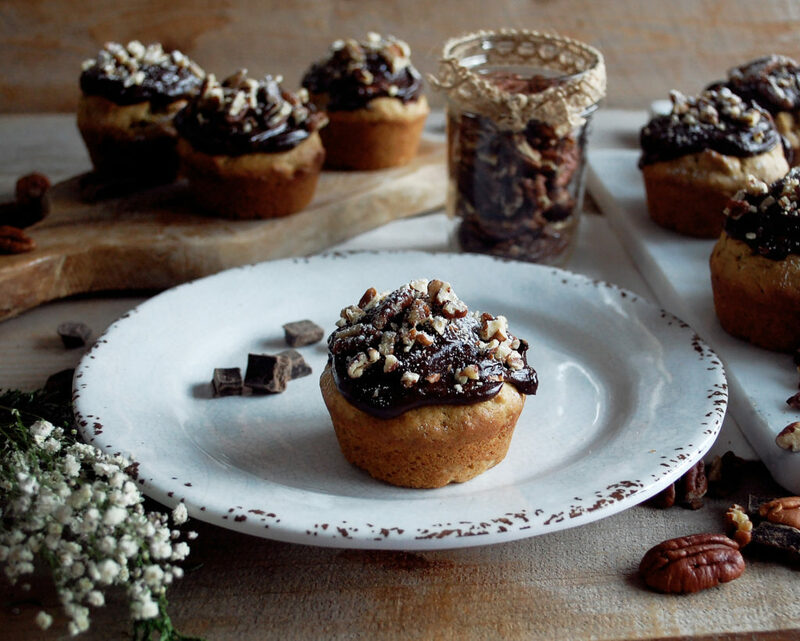 You can’t go wrong with a sweet, tender muffin with chunks of banana and toasty pecan pieces, topped with a silky, rich chocolate ganache. 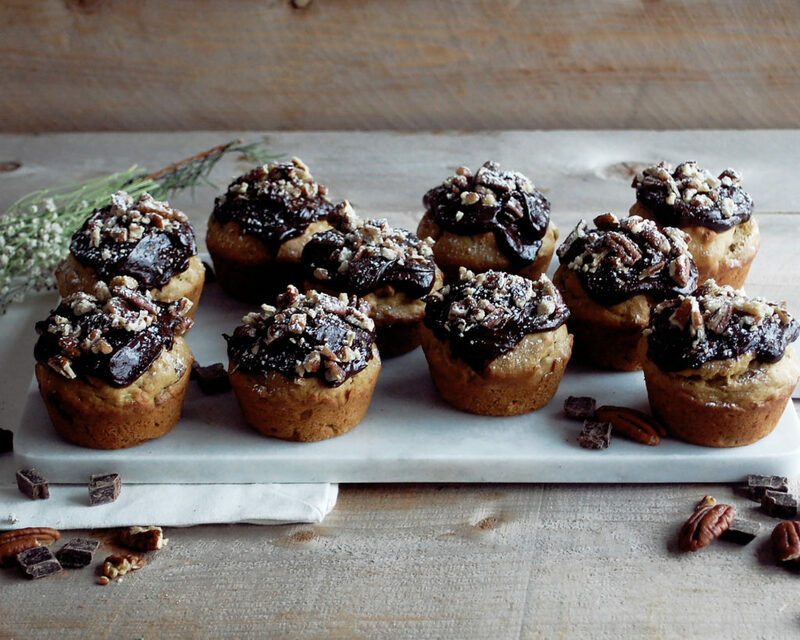 I’m sort of torn as to what part of the day these muffins are best for. Banana bread and muffins in general are typically breakfast foods, but for me I like my morning meal to be very nutritious. In that case, I’d make a banana bread that’s a little bit healthier by making substitutions with coconut oil, Greek yogurt, and honey. 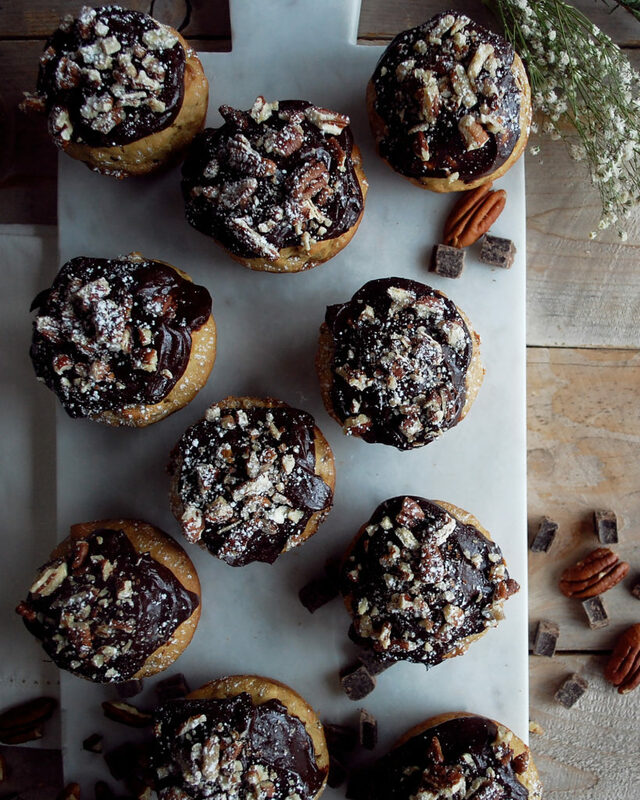 However, this recipe includes a butter and sugar kind of muffin, plus a chocolate ganache, which seems too decadent to be eating early on in the day. So, I’ve decided that I personally like these best as a dessert. However, they are delicious whenever you’d like. 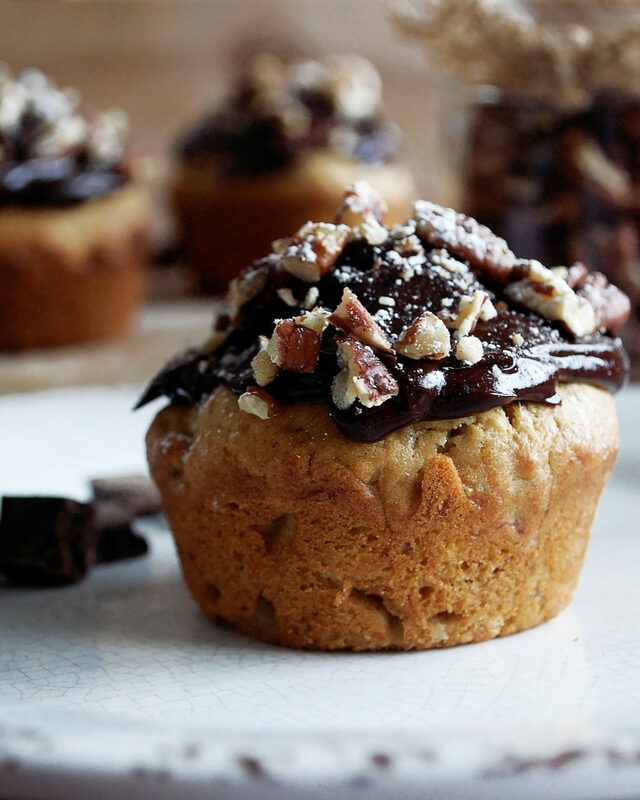 In the muffins, I use brown sugar for a deep, molasses flavor and really, really brown bananas for lots of natural sweetness. After you cream the butter with the brown sugar, and then add the eggs, you want to mix the rest by hand using a wooden spoon. 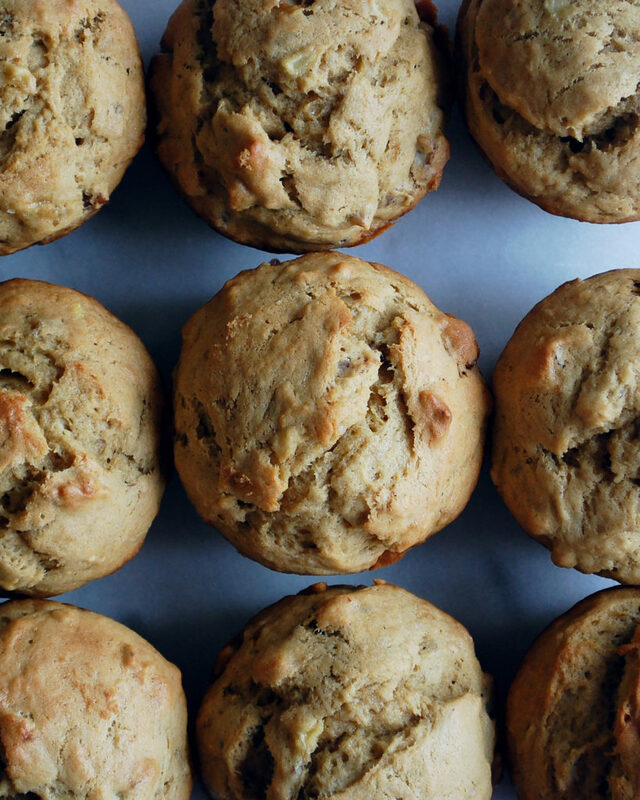 This way the bananas can stay somewhat chunky and add little bursts of banana flavor and texture within the muffins. Hand-mixing the dry ingredients in will also help prevent over-mixing the batter which would result in tough muffins. A chocolate ganache might sound fancy, but it’s as simple as heating some cream and pouring it over the chocolate. I mix in a little vanilla extract as well. I like to cool both the muffins and the ganache before “frosting” the muffins. That way the ganache can set up and won’t just melt onto the muffins. After that, I add some crunch on top with toasted pecans (which are also inside the muffin) and a light dusting of powdered sugar. No matter what time of day you eat these, I hope you enjoy them as much as I do. Enjoy! Preheat the oven to 350F. Grease a muffin tin with butter and set aside. In a large mixing bowl, use an electric mixer to beat the butter with the brown sugar until smooth. Beat in one egg at a time. Use a wooden spoon to fold in the mashed bananas. In a separate mixing bowl, whisk together the flour, baking powder, baking soda, and salt. Gradually add this mixture to the wet ingredients, mixing with the wooden spoon until incorporated. Stir in the toasted pecan pieces at the end. Divide the batter into the muffin tin, filling each space about ¾ of the way, or until all of the batter is used. Bake the muffins for about 20-25 minutes, or until cooked through. Let the muffins cool slightly. While the muffins bake, heat the cream in a small saucepan over medium heat. Meanwhile, place the chocolate in a mixing bowl. When the cream comes up to a simmer, pour it into the bowl over the chocolate. Let sit for a minute or two so that the cream can melt the chocolate. Add the vanilla and stir the mixture until fully incorporated. Let cool until the ganache thickens and sets up. 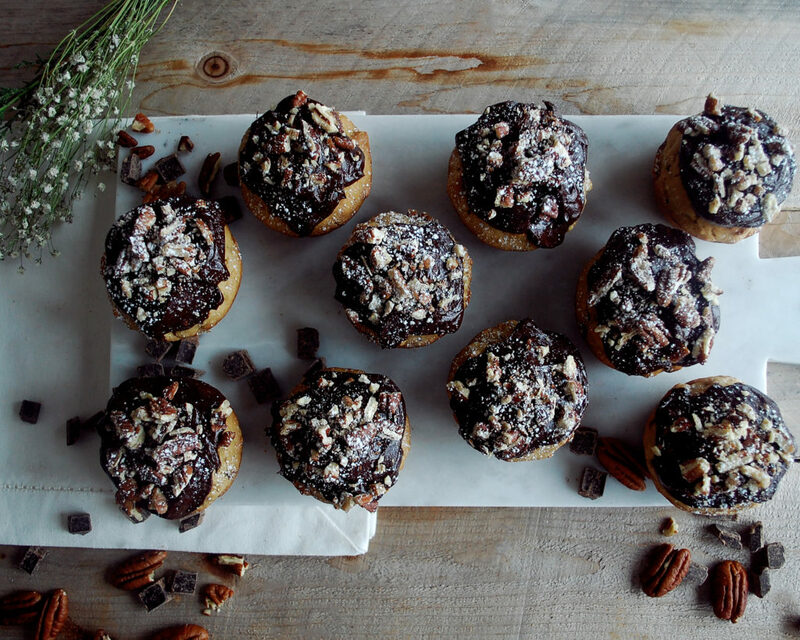 Spread a generous amount of chocolate ganache onto the tops of each muffin. 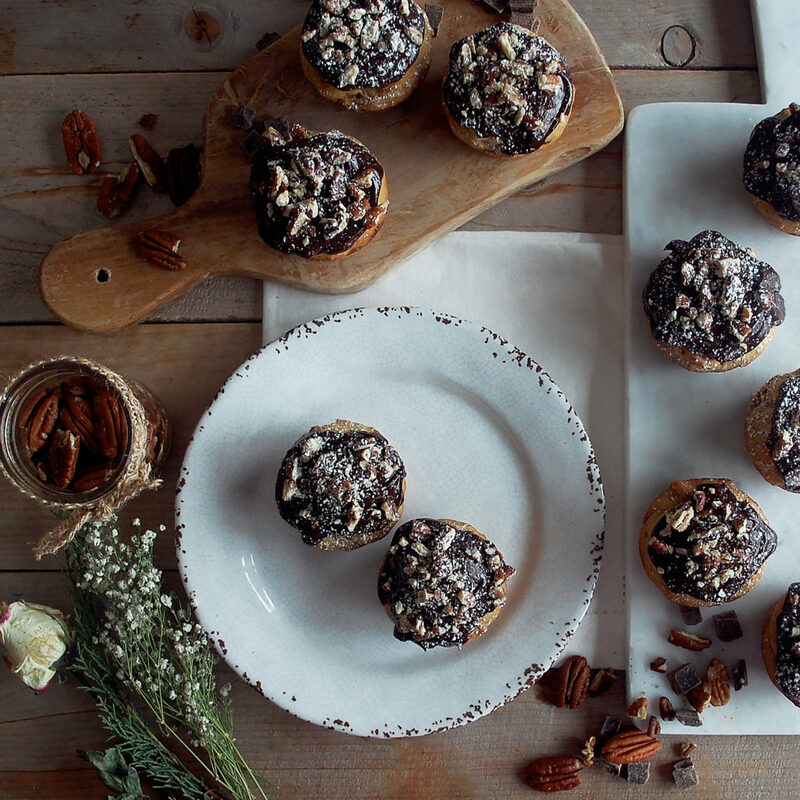 Garnish with more toasted pecans and a sprinkle of powdered sugar. 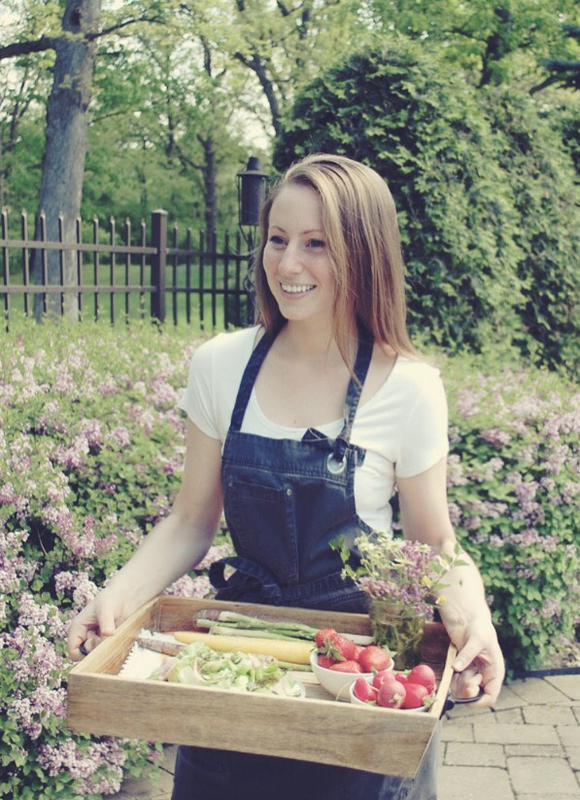 Every oven cooks differently. Use the 20-25 minutes as a range, but once it gets to about 18 minutes, you can start checking the muffins for doneness. Insert a toothpick into the center of one of the muffins and push it all the way down. If the toothpick comes out completely dry, the muffins are done. If it comes out with any wet batter on it, they still need more time.